During April 2018 I was interviewed by branding expert, author and keynote speaker, Jane Anderson, for a webcast attended by a group of Jane’s program mentees, ‘Women with Influence – Female entrepreneurs leveraging their personal brand for business growth’. Jane approached me about being a guest speaker on one of her webcasts. She finds many of her mentees get busy quickly but are unsure about outsourcing and engaging a virtual assistant. The idea was to introduce them to the world of outsourcing, what can be outsourced and how it all works. JANE: Okay, so without further ado, I want to be able to introduce our very special guest today who’s kindly given up her time. Our very special guest today is a Virtual Administration and Social Media Support Partner and she, who along with her team, support time-poor business owners. I think we can all relate to that. For over twelve years, she has run Interim Business Solutions which is a one-stop shop offering general administration, social media, copywriting, outbound calls, and transcription support. She is also an avid power waddler, a connoisseur of coffee and weekend wines, and has a serious case of the travel bug having already visited over thirty-five countries. Please welcome Kirsty Wilson, so everybody give Kirsty a round of applause. All the claps are going crazy on the screen and Kirsty, I am going to un-mute you. Ah, here we go. So there you go. Hi Kirsty, can you hear me okay? KIRSTY: Hello. Thank you for the lovely introduction. JANE: My pleasure. I can come along to any speaking gigs you would like and be your MC. KIRSTY: Hello and hello to all the busy ladies out there. JANE: Thank you, we’ve got, all the ladies are in a program we have called ‘The Women with the Influence’ program as I mentioned to you, so most of them have practices as Business Coaches, Confidence Coaches or Confidence Experts. Some are building their speaking part of their business, some are building the mentoring part of their businesses and we’ve got a couple who focus on their message around resilience. So, they’re all sort of delivering in those modes of speaking, training, coaching; all those things that you’re very used to, Kirsty, so I knew that you would have to be the person that I could ask to come on. You know, having done a bit of work with you I love how you operate, so really appreciate you coming on because of your awareness of this industry and you’ve been around for twelve years. You’ve been doing this for twelve years, my God. KIRSTY: Well, the business has changed over that time. In the early days I even did a lot of site work because the access to the internet just wasn’t what it is now. I then joined social media, but that’s all part of my story further along. JANE: Tell us about that. Tell us about how you started and about the business itself and tell us all about you. KIRSTY: I’m actually a four year trained Primary School Teacher but there was no teaching work when I got back from my overseas trip having travelled to thirty-five countries and I ended up just having a change of direction. It all just came my way and one thing led to another. I managed to end up being the Business Manager at a tax and accounting firm for six years where I really learned a lot about business and running a business, which I’d had no exposure to before and thought, I could be my own boss. What can I do to be my own boss, because I was tired of having a boss. I knew the Virtual Assistant industry was around. It wasn’t what it is now but it was around, and I started my business in 2005 when I really knew there was a need for small businesses and solopreneurs to access business admin support. As I mentioned, a lot of it was, you know, site work with a bit of virtual, and then in 2008 I discovered social media and that’s when the virtual side really just took off. KIRSTY: I pretty much stopped all site work and became a hundred percent virtual. Most of my clients have actually come from Twitter. KIRSTY: Twitter was amazing. Back in 2008 I joined. In 2009 and 2010 it was a very different place to what it is now, in that it was all very organic. The marketers hadn’t discovered it, the bots, the spammers etc etc. It was really just about networking in the virtual space and unlike Facebook which you need to be friends, you could connect with anyone and everyone, it was open slather on Twitter. It was very easy to find people using hashtags. Hashtags were first, you know, generated on Twitter. So to date I’ve had about two hundred and ninety enquiries from Twitter with a forty-seven percent conversion! The results from Twitter has left all other platforms miles behind. You know, that’s just been amazing. My biggest client I met in 2009 and she’s regional England. She’s a client still to this date. Social media has been what has encouraged and developed the reach for my business. JANE: That’s incredible, Kirsty. So do you still use Twitter today for clients? KIRSTY: I do, but I schedule a lot and I generally check-in frequently during the day. The engagement just isn’t there like it used to be, and for myself, I mean really, I don’t need all these platforms anymore. I mean even yesterday I had three referrals in twenty-four hours. Really, I could walk away from social media because I get so many referrals. It’s a wonderful place to be in but because I offer it as a service, I need to be seen doing it. There’s nothing worse than someone saying “Oh, you know I’m an expert or a guru in this, that and the other” and you go and check them out, and you think “Oh but you know you’ve only got a hundred and twenty followers and you’re only following eighty. How can you be a social media guru?” You do, you’ve got to be seen doing it if you’re going to offer it. JANE: That’s right, exactly. So, you and I, for everyone’s benefit Kirsty and I have been working on a project for a client. This client has a practice, he actually had more of a business, so we’ve been talking about this concept of “worker, thinker, hustler” Kirsty. JANE: And different business models around when we say a “worker” is someone who thrives on being in the training room and delivery or speaking, but a “creator” is someone, I’m sorry, a “thinker” is someone who tends to, you know, build a lot of their IP and their own thinking and their own concepts, and then we talk about the “hustler” or the selling side of it. It’s a concept taken from a lady called Lisa O’Neill, who’s a Thought Leader in New Zealand, and we talk about getting that balance right. So Kirsty and I have been working with an expert who is very heavy “worker”, very heavy on delivery. Loves delivery, loves being in the training room and doesn’t do as much of “thinker”. What we’ve been doing is helping him to sort of position himself as a less of a business partner in connecting with other businesses who already have that IP and delivering it and helping him set up his own personal brand a little bit more solidly. He has had it, but it’s only been really for at first speaking and then all the programs are delivered through these other brands. Kirsty and I’ve been working with him on helping him to pull that brand out more and set up, and to make that all happen. What we’ve had to do is set up in the background, and Kirsty’s been working on this and she’s done this for other experts, is, you know, setting up the back end like Insightly in this case, and splitting lists and setting up MailChimp and all that sort of stuff. Kirsty, what are you, what do you notice? You’ve worked with experts and then you’ve worked with other business owners that are not necessarily speakers, coaches, trainers. What do you notice is the big difference working with or supporting experts and, sort of, particularly because your business aim is about Interim Business Solutions. You kind of come in before they’re putting on a full-time Business Manager or something like that. Is that right? KIRSTY: Largely, I mean a lot of them are just solopreneurs and they just don’t have the volume of work to have an employee nor do they want one. For myself, largely the big motivation to start my business was to give business owners, employers, whatever, a choice to how they got their administration done because having an employee, you have to pay all your overheads with annual leave, sick leave, etc. There’s a lot of other things you’ve got to take into consideration whereas, obviously, if you have a contractor, you get the support, you get the jobs done, you’ve got someone to bounce the ideas off because they’re a business owner as well and they get the hours that are involved. Of course then they send you an invoice, you pay the invoice and that’s it. KIRSTY: Whereas you don’t have all the other, you know, possible downtime you may experience using an employee. If I’m not working for you, I’m assisting someone else. KIRSTY: But you don’t have to pay for that, so there’s all those sort of things to take into consideration when engaging a virtual assistant / contractor. With experts, I think a lot of them I have found, this is just from my perception of twelve years, and not just the speaker experts but obviously the bookkeepers and then anyone who’s running their own business, they’re experts in their own area, is that generally they’re all very smart and that’s why they’re doing what they’re doing, and they’re ideas people. KIRSTY: And so a lot of the time they don’t have the time for the detail because they’re too busy delivering and having ideas. KIRSTY: That’s where they need the admin support because generally us admin people, we are very detail orientated. You know we like the i’s dotted and the t’s crossed and I’ll be quite honest, and I’ll be the first to admit that I’m not an ideas person. I’m very much a doer and an implementer, and so that’s why I’m a great partner for those creative people. I can free them up to implement their creative ideas. KIRSTY: Yes, so that’s one thing that I’ve noticed with working with experts of any industry largely. JANE: Kirsty, what I found, I don’t know if you found this sometimes, when people are starting to grow, they’ve got those ideas. So, for this group we’re starting out doing a lot of this and we can see that they’re often going to ‘get’ they’re going to get busy in the next coming year, next twelve to eighteen months where they start to think “Okay, now might be time.” Where do you start with them if they’re like, say the person we’ve been working with, or if they’re starting to get that momentum, what are some of the first things that you often get them to do? I talk to them about MailChimp is often a good one to start with, because in the work that we do is where I’m packing a lot of IP and we’ve got to get communication and building lists and things, and getting selling ourselves and selling our ideas. JANE: And the CRM. Is that where you generally start? KIRSTY: It just depends obviously on each person who approaches me and what the nature of their industry is. I mean, some know they need help. They’re getting super busy in their business but they’ve never used a VA before. They can’t get around their head letting go of stuff and so I usually always start with “Ok, so what’s one task or one thing you don’t like to do or you know you shouldn’t be doing? We’ll work out a system and a process so that you can hand it over”. Basically then, that’s a great starting point and obviously then you can determine whether they might have a CRM or they’re doing newsletters. I’ve had some who just don’t have time for it and they don’t need it. KIRSTY: I’ve got another lady who really needed a CRM, and I set her up with one. She does not touch it. She’ll actually even email me every time she wants to send me something and say “What’s your address again?” and I’ll have to reply back “It’s in your CRM” and she says, “Oh yeah, I forgot I got that!”. She just doesn’t use it. I manage it, I look after it, I use it. She just doesn’t go near it! KIRSTY: Everybody works differently. Even, every VA is going to be either a good fit or not a good fit, because everyone will work differently. As we all know, not everyone’s your cup of tea and it’s going to be the same in this relationship too. So it’s really important that you find someone who you really gel with because obviously if that relationship is strong, everything will just fall into place and work really well. KIRSTY: The VA will bend over backwards to support you, especially if you’re gracious and you’re a joy to work with. JANE: Isn’t it funny? I was actually going to say that. Kirsty and I were talking the other day about the difference between working with different clients, and you were saying, and everybody’s a bit different and not to make it a men versus women kind of thing, but we were talking a bit about how the difference between when you’re working and supporting other women, what are some of the things you notice when you’re working with them from your perspective? KIRSTY: Generally, they’re much better communicators than men. If we’re going to do comparisons. Look, I’ve actually told Jane this little story, but I mean I’ve had a fair few fellas this year who, you might say to them “Now do you want ABC or XYZ?” and they’ll reply with “Yes”. Just “thanks” to everything. It’s like “thanks” and you’re thinking “What do you want?”. They just don’t like to elaborate. You’ve always got to go back to them and clarify which you don’t really want to be doing that, but as a VA you can never assume what clients want. KIRSTY: As soon as you assume, you’re going to assume the wrong thing. I clarify anything that’s not clear, but generally, I find the ladies do tend to give the information first up. KIRSTY: That’s something I’ve noticed over the twelve years. I could be generalising but it’s been my experience. The blokes are like “Here, can you get this done?” You do it, and they reply with “Thanks”. KIRSTY: During Easter, I actually did four hours of work for a client that do monthly reports and they’re always done over the first and second of each month, which of course just fell over Easter. Look, I was around. It was no big deal for me to do that. I was more than happy to do it. I had nothing planned and I spoke to her yesterday and she says to me “I really need to send you something. We were so grateful that you did the reports”. I said “You don’t need to send me anything, you know. This is what I do for you.” They are just such a joy to work with that you’re more than happy to help them. JANE: Yes, that’s reassuring for us because I know when I started, I hadn’t heard of Virtual Assistants before and I just thought “Ah, would someone really want to help me with this? Really? Who would want to help me with this?” That was definitely my experience. I couldn’t believe this industry actually existed and the wonderful support I got and before I started to get to a point where I needed someone full-time. I loved that I got the same experience, same connection with the lady I worked with when I started. KIRSTY: That’s really important. Yes, that’s very good. JANE: Kirsty, I don’t know if you find this, but sometimes the question I get asked is “Could I really engage someone to help me? Doesn’t it cost the same as almost putting on someone? What if I have a quiet month?” You know, things like that. What do you find, and it doesn’t necessarily even have to be yourself, just in the industry in general. Some are on hourly rates or some you buy a certain set amount of hours or some are a monthly fee. JANE: How does that work? KIRSTY: Engaging a VA can vary from VA to VA, and as to whether you offshore or use an Australian VA. Obviously an Aussie VA is going to charge higher because their cost of living is higher and all those sort of things, but the term “virtual assistant” is really broad. It’s anyone who works virtually, so it could be a bookkeeper or it could just be someone who does copy typing, so the rates are going to vary and also the way some have programs and some do hourly rate. I generally just do hourly rate, though I might quote for projects because I do project-based work as well. It just really varies from job to job, but all my regular clients who I do regular work with that I might do daily ad-hoc stuff, their regular social media support and things like that, they’re all on a set rate. The rates for an Aussie VA can vary anything really from $30-$35 an hour right up to $70. If they do bookkeeping and they’re a BAS agent, because obviously they’ve got all their learning to keep up to date with, so it really will vary. Obviously their years of experience will reflect as well. A new VA, who might be sort of early twenties with really no experience or business experience would probably charge $30 to $35 an hour. KIRSTY: Of course that includes their Superannuation, tax, holiday and sick leave and everything like that. JANE: So they sort all that out. They’re invoicing you. KIRSTY: That’s right. They’re business owners so whatever arrangement you come up with; whether it’s on a retainer or an hourly rate, then when they invoice it’s based on what’s been provided for that period. JANE: Yes. Kirsty, I think sometimes. I know when I started there were two things I was most concerned about. One was trust and somebody having access to all my stuff. KIRSTY: I understand that totally. JANE: Yes, and I had to ask around. I found the easiest way was to ask for a referral which is what you talked about before. How you, in this game it’s a lot about trust, isn’t it? You find someone you like, who you trust, who you think you can work with. Is that what you find? KIRSTY: Oh for sure. I mean largely, I probably have had more than a dozen referrals this year already, and then for a variety of things as well because I offer a variety of services, so some services I don’t even do myself because that’s not my thing. Many years ago a client said to me “Our Transcriptionist is no longer available, can you do transcription?” and I couldn’t, that’s not my thing. I don’t have a secretarial background but I can probably put a team together and help you out that way. 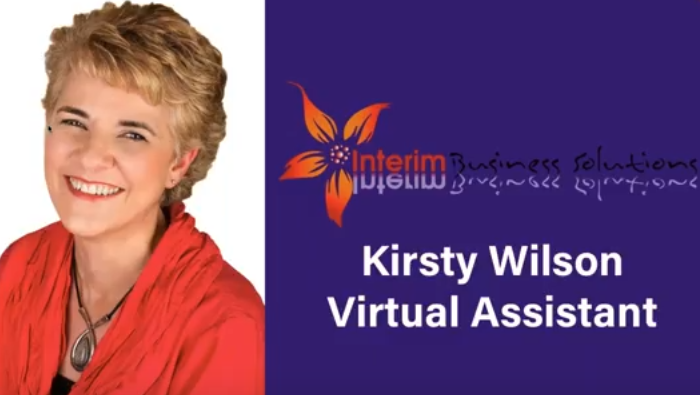 They replied with “You do that, we will know you will manage it and it will all get done.” That experience gave me the business confidence to think I don’t need to just be Kirsty Wilson, the Virtual Assistant but move to Interim Business Solutions, the business. KIRSTY: Of course if someone has a problem with that, well they’ll need to go elsewhere but majority of the time they don’t really care. Certainly all my clients who I work with at the moment, they don’t mind who does the work so long as it gets done and in a timely manner. The good thing there too is that things can tick along. The regular stuff can tick along when I’m on leave as well then. KIRSTY: There’s a lot of Virtual Assistants that are very much like a PA and so they might only have one to three clients and do maybe around ten hours with each client per week in that sort of arrangement. Whereas mine’s probably a little different. KIRSTY: In that I offer lots of different services, work with different businesses and I really just always need to have a conversation with anyone that makes an inquiry to work out exactly what they want and whether they can be slotted in really. JANE: Yes, and that’s what I thought was kind of unique about your business because I’ve just put a picture up here of your home page on your business, and I just grabbed the services and drop-down menu to give people a bit of an idea about the types of things you can get help with. That was one of the concerns that I had too, was do you, like what I was worried about is investing in one person to help me because surely they don’t know how to do everything. JANE: So what happens if they don’t. Do then I have to go and find someone else, or the other thing was what if I just need them to set up something and what if I don’t need them ongoing. Which is what you’re talking about the project-based type things and it might just set up Insightly, or just set up MailChimp or something like that. The other concern I also was worried about was what if they got sick. You know, what happens if they got unwell? Who steps in? There was, to me there are a lot of risk factors that came in. So, in your business with the Interim Business Solutions and this is what I like about your model, is that you’ve got people around you or you’ve got people that you’re delegating tasks to. JANE: They’re doing some of these things. One of the questions that’s come through here from Jo. She’s saying “Does Kirsty have a team to delegate to herself or does she do everything and she’s put EVERYTHING in capital letters”. KIRSTY: No. I don’t do everything. At the moment, I’ve got about twenty-seven active clients so I certainly don’t do everything. JANE: That’s incredible, isn’t it? That’s a real credit to you. KIRSTY: What I always say to people is that when you buy a house from a builder, the builder doesn’t build the whole house because he’s obviously not a plumber, an electrician, the tiler. He can’t do all of that, and so a builder sells the concept of the house and what it’s going to look like and then he engages all the subcontractors. The bricklayer, who is the expert in bricklaying and the roofer, putting the roof trusses on and all the rest. That’s basically a good example of my business in that I offer the services that I know that I can easily get others to do. I don’t do websites because that’s a large project and I don’t want to be caught in the middle between a client and a team member managing. It’s about working out what’s fairly easy to get others to do to leverage others and obviously then I can also offer so much more to my clients. JANE: Yes, that’s right. Your time is focused on being able to be a bit more strategic for them or whatever focus you need. I’m just going to encourage anybody to pop any questions up. Now is a good time to put any questions in the question box. Jo’s popped hers in, so while we’re getting a little bit closer to time, feel free to pop anything you want me to asked and I will ask Kirsty while we’re starting to wrap up. Pop it in there and in the meantime, Kirsty, based on this type of group where we’re starting out and we can sort of start to see “Okay, I’m going to get busy”. At the moment we’re just getting focused on what are we actually selling, what are the programs that we deliver, how much we sell them for, you know juggling families as well because we’re women and we’ve got all those commitments. Is there any anything else that you sort of find that when you’re working with people like us that we should know or be aware of that will help us to grow our practices or that you see opportunities? One of the things I often see is sometimes we hold on too long before we get someone to help. KIRSTY: Yes, that would be probably my biggest advice is get all your systems and processes documented and streamlined so that you can have all those foundations in place so that you can grow. For myself from day one, I registered for GST. I mean, I know a lot of VAs who would probably try their hardest to keep their income under the seventy-five thousand because registering for GST would be too hard and too scary, whereas I’ve always wanted to be seen as a business owner offering professional services. This is not a little hobby business who does a bit of typing at night when the kids go to bed. All those sorts of foundations. A CRM, I would highly recommend if you haven’t got one. Get one straight away and get all your contacts in there. Whether they be clients, leads, suppliers, you’ve got one central place. I left mine a little bit too long so I relied on MYOB when it was still desktop version. KIRSTY: But, of course, that only had minimal information. You couldn’t put notes in there. I mean, there was no room for social media IDs because that hadn’t even really generated back then. So, a CRM that where at least you can have everything there and obviously one that you know you can link to doing your newsletters and correspondence, even better. KIRSTY: An Accounting Program as well. KIRSTY: Especially if you do charge GST, because you don’t want to be doing it in an Excel spreadsheet. KIRSTY: Unless you’ve obviously engaged a Bookkeeper, and your Bookkeeper’s looking after all of that. That’s probably just going to vary from business to business. I use Xero and I do all my own bookkeeping because I actually quite enjoy it, but when I moved from MYOB to Xero, I thought “Right, I’ve got to let go of something”, so I let go of doing my BAS and I didn’t want to learn how to do it in Xero. One of my clients who is a Bookkeeper and who’s just lovely to work with. We work very similarly and it just made sense to say to her “You can do my BAS now!”. JANE: Great, so good if you can find someone like that. You know, it just makes such a difference, especially doing accounts. KIRSTY: Yes. The biggest thing would be just to get everything streamlined, get all your processes so that you’re not feeling like you’re juggling balls, and balls are dropping off the desk. JANE: That’s something like, because sometimes we’re so focused on trying to get revenue in and an income, if you haven’t necessarily started those processes. I just started in a Word document and just started to capture, okay well what are the five things. Even just starting to flesh it out. I just had a Word document for most things, like how do I deal with a customer but then an incoming inquiry or how I booked someone in. I just, I did probably one thing a week or something like that. I just allocated in an hour in the calendar. It was probably usually a Friday job, I think I used to do it. Is that something that, like as you’re growing, if you haven’t been able to capture those things, is that something that VAs will help you with as well? KIRSTY: Oh, for sure. Yes, especially because we’ve done it. I mean, I did it twelve years ago. It’s sometime ago now, but you’ve got a fair idea. The sooner you really start nutting out the whole processes of it, things will just always tick along. Like for me, I’ve got an enquiry form and whilst I’ve got nearly everything that’s not paper, it’s one thing that I do use is paper because quite often when a phone call comes in, I’m not at my desk. I might be somewhere else. I work at home so I’ve got a home office and I can just write everything down. It’s also the prompts of everything I need to ask; how did you find out about me, what do you need and what’s your website and what’s your email? Just all the things. I don’t get off the phone and think “Oh dear, I forgot to ask this or that”, and then, of course, that information then gets plugged into my CRM. So, of course, even if that person who made the enquiry doesn’t convert, they might come back three years later or refer someone. I’ve always got that history of when I’ve spoken to someone or who referred them, did I meet them on Twitter or Facebook etc, and that’s all documented. That’s just the enquiry, so then the enquiry goes into the CRM and I send an engagement letter if they’re interested to proceed. They sign and then they become a client, so there’s that whole on-boarding process as well. JANE: Yes. I even just encourage when people are starting out, in particular say this group where we’re getting started, I say even if you can just have some of those things even in a spreadsheet or Word document. Even if you haven’t got a CRM system just yet, is even just get the contacts out of the email and get it on it spreadsheet because when it comes time to getting help, it’s much easier. Just click over and you save money and time. KIRSTY: That’s right. Just import it. As you would know, Jane, the beauty of a CRM is that you can basically tag people. If you need to do a search for like, for me, I have tagged past client and current client and then also all the services. If suddenly someone says to me, “I really need a web designer. Who can you recommend?”, I can go to my CRM and bring up my list of all my web designers that I’ve got in there and who does what. That way, I can help people connect with people as well, so I can think “This person does WordPress, or this person specialises in Squarespace” or whatever. KIRSTY: I can then refer on the most appropriate contacts. Your CRM can become so valuable, not just for yourself but connecting others as well. JANE: I love that. That’s excellent, so you’ve given us so much valuable information, Kirsty. I know how busy you are with twenty-seven clients on the flow. My God. KIRSTY: Some are sleeping right now. JANE: It’s always nice when they sleep, unless you’re getting ones like me and I don’t sleep and I’m getting emails all the time. I’ve just put the website up on here and I’ve put some of the information. Kirsty’s available at your website, which is Interim Business Solutions. Yes? KIRSTY: Just interimbusiness.com.au. No “solutions” on the end because I didn’t want a really long URL and I didn’t want “ibs” because it’s irritable bowel syndrome! KIRSTY: It was a bit tricky trying to work out and, of course, this was twelve years ago before you really knew about SEO and I should have a keyword in there but it is what it is. JANE: Thank you so much for joining us, so if you want to connect with Kirsty, follow her on Instagram, she’s got a great food feed that she puts out. It is great and yummy. KIRSTY: Well, I think for me it’s not just about broadcasting my business, it’s about connecting with me as a person. On social media, followers are going to get a good mix of what I offer but also who I am and what I like. KIRSTY: Being authentic as well, you know. What you see is what you get. JANE: You’re a straight shooter. I just love that about you. That you just know where you stand, and it’s just get in and get it done. JANE: Connect with Kirsty. She’s a great person to have around you or to know, but even if, just knowing how this industry works so that when the time comes if you do need help, hopefully today you feel a little bit like “okay, I’ve now got a little bit of a sense” and maybe not as fearful as maybe I was when I was like I’ve got to finally make this leap when the time came. I really appreciate you coming on board today. Thank you so much. KIRSTY: It’s been a pleasure. Thank you for considering me to be part. It’s been a lot of fun sharing more about the VA industry. JANE: That’s great. All right, I’m going to close off. We got a clap and a round of applause. Katherine’s in the dentist and clapping away already. She’s not mucking around, so you’ve got claps all round. They’re all clapping on the street. JANE: So just to wrap up. I’m going to mute Kirsty. All right, so I hope that you found that useful. I’m going to put the recording up in the Facebook group and love for you to share what was useful, what was helpful and I can give Kirsty some other feedback as we go on as well. I talked about the changes to accountability game that I’m going to make, I talked about Tracy Hughes coming up. Then also talked about this week which “Power Up” which is coming up at the coast on the 18th of May, so I’ll be putting some more information up with chasing up final details of accommodation if you want to stay. Just a reminder to keep using your chart. We talked this week on setting up the habits and routines to match the chart so it’s reaching out to the five per day, writing your blog. If I looked at your calendar, ideally it matches the tasks that are on here. The calendar, if you look at it, it does have that balance of “thinker”, “worker” and “hustler”. It’s got those three things integrated into it, so is taking that and going “well how much time do I need per day to be doing each of these things” along with obviously delivering your work. If you haven’t already is, Virginia will be keeping an eye on your tracking document. This is your weekly accountability and tracking sheet, so if you can keep your numbers. As Kirsty would say, if I don’t know, you’ve got to know your numbers, you’ve got to know, you’ve got to get close to your numbers. Sometimes I think we sort of distance ourselves a little bit and we focus a bit too much on the creativity, but we want to focus on what are the actions you’re taking, how many people are reaching out to, how many activity, how many meetings have you had, how many sales have you had, how much IP are you unpacking? Get close to your numbers. These are things I monitor in my practice and I know that those whether they’re starting out or if had a practice for a long time, they watch these numbers and I would really encourage you to continue to keep filling that out. Also to keep encouraging you to filling out, sorry to keep watching the “expert to influencer” modules in in the online area so that you can continue to use the resources tools in there. If you’re writing your book this quarter, continue to. You’ve got that there if you’re doing your webcast. There’s the documents there on how to plan and deliver your webcasts, all those types of things. Make sure you’re still following that. Have a fantastic rest of the week as there’s only one day till Friday. Have a great weekend and I will catch you next week. Thanks again Kirsty for joining us.